Here you'll find instructions for how to paint a flower pot with a number of different design ideas for spring and summer. This is a great garden craft for kids to do outside- why don't you get friends over and paint your pots together out on the grass!? Acrylic paints OR poster paints, but if you are wanting thick maximum coverage you should do a layer or white acrylic paint first). Below there are ideas for four different designs. If your kids have their own ideas let them be creative. These are just intended to be inspirtaion if your kids. 1. 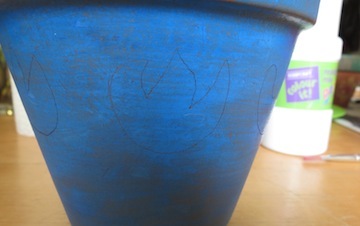 Cover the pot in blue paint. If you want it to be vibrant, smooth coverage then do a layer of white acrylic paint first.You could do this before giving the pot to your kids so they don't have to mess around with acrylics. Let it dry and do another coat of blue. 2. 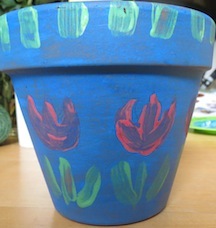 Depending on how old your child is, you could dry some tulip outlines on the pot for them to "paint in" in red paint. They can paint stems in green. 3. Once the paint is dry cover in a layer of clear varnish to stop the paint flaking and make the pot waterproof. 1. This is really simple as you don't need an under coat of paint. 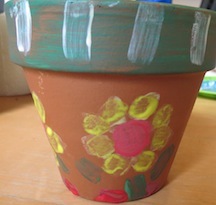 Just make red dots round the pot and then put yellow petals around the, a green stem and some pattern around the rim. Done! Don't forget to varnish when dry! 1. 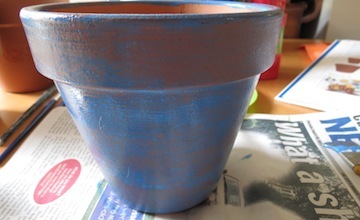 Paint the pot blue (or any base colour). Paint large dots in a circle round the middle of the pot. Then place smaller dots above and below. Finish with little spot scattered amongst the larger dots. 1. Paint the pot a base colour - here we did red. 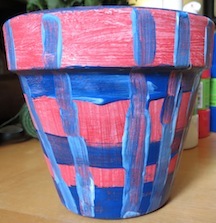 Then put stripes around the pot, let them dry and then paint more stripes down the pot. Super easy. 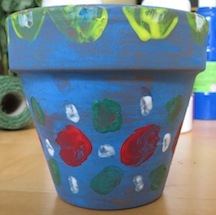 There are SO many more ways to paint a flower pot! These are just a few ideas that we had fun doing. 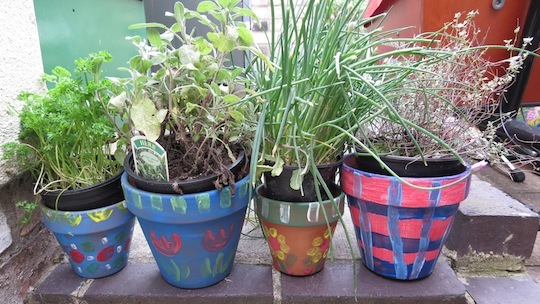 Let your kids experiment with colours and inspiration from the garden or parks around them. 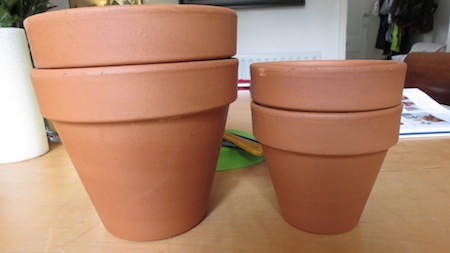 TIP: Why not paint pots in the spring and grow some herbs or a flower in the pot that they can look after a water! ?